Trevor McNevan grew up in the blue-collar, bedroom community of Peterborough, Ontario, Canada, not too far north of the bustling metropolis of Toronto, Ontario. McNevan and his longtime friend and guitarist, Dave Smith came together after the demise of Oddball, their previous musical endeavor fizzled out in 1996 after releasing only a single album (“Shutterbug”), which also featured future Three Days Grace drummer Neil Sanderson and bassist, Tim Baxter. It was at this point when McNevan came up with the idea for a band and a name that symbolized the point in their life where “we realize we can’t make it on our own strength.” It was a cathartic moment for the singer with the melodic rock voice and hip-hop influences of his youth. It was a moment of inspiration that drove McNevan and the band forward to do their own kind of thing – Thousand Foot Krutch. I got to speak with Trevor McNevan, singer and founding member of TFK during Christmas week, while he and the band were on a break for the Christmas and New Years’ holiday, and also a break from rehearsals for their new North American tour starting in early January 2017. Brian McKinny: So tell me a bit about your background. You’ve spent the last ten years or so with your wife and kids in Nashville, but you’re originally from Peterborough, Ontario, Canada. Trevor McNevan: Yep, born and raised here in Peterborough. I started a band at the end of high school – that would’ve been 1996, and it’s been an incredible journey, brother. I’d made some records before that, actually, when I was younger. It was mostly a lot of hip-hop stuff – I think I was one of only two people in my whole town who listened to hip-hop! We had one classic rock station in our town, and hip-hop’s always kind of been in the bloodline, my musical DNA since then. I started the band at the end of high school, and have had a few different members over the years. I’m the only original member, but my bassist, Joel Bruyere, and drummer, Steve Augustine, have been with me for a long time – fifteen years, so that’s a long time. McKinny: When did you first get into playing music, singing and performing? McNevan: I guess when I was eight, my mom tells me I sang at my aunt and uncle’s wedding, and later that same year, they had bought one of those old one-ton wooden stereo cabinet units that has speakers and a turntable built into it with a 2-inch mic cord – well, we had one of those, and they bought me Michael Jackson’s “Thriller” record, and it was just on from that point. It became my life; I just wanted to sit there in front of that thing and listen to everything I could, until I was completely worn out from singing along with it. Yeah, not to sound dramatic, but to be honest, I didn’t really feel like I started a band, but more like I had answered a calling. It’s just that music’s always really spoken to me and communicated to me. It’s been a blessing to be able to kind of turn that into an outlet and to use my voice to communicate to others my music in my songs, so it’s been a really cool journey. McKinny: Tell me how you started the band. It wasn’t your first project – nobody seems to be so lucky as to hit the ground running, to have their first foray into music be successful. McNevan: That’s so true! I had a hip-hop tape – back when people made tapes – but I was thirteen years old then. And then I was working at McDonald’s, actually, when I was fifteen… It’s funny how many bands have come out of this town —My Darkest Days, one of the guys from Art of Dying… A whole bunch of us used to work at McDonald’s together, so I met and worked with a lot of musicians there. I did a record when I was sixteen, called “Oddball.” It was kind of power rock. We had 27 songs – the first part of it was hip-hop and then the record stopped — it had this sort of applause track, and then the rest of it was rock. 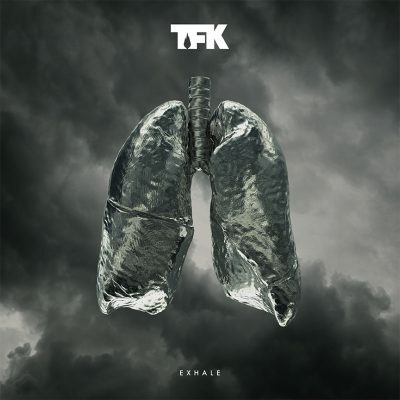 It had a sort of eclectic mix of things, and then I started TFK the next year. It’s always been kind of a melting pot of what inspired me musically, what inspired me to write. Our records have always had diversity, a variety of styles and influences to them that takes the audience on a kind of musical journey, so that’s been a common thread throughout our records. It’s been a natural progression along the years, stylistically speaking, so it’s always been a bit of a broad spectrum of — not necessarily genre, but a sense that we don’t really want to stay on the same thing for too long. McKinny: What was the music scene like when you guys were coming up outside of Toronto? What were some of the other bands you guys were friends with or played with before you got signed to a label? McNevan: Actually, in my hometown of Peterborough, and also in Toronto, we had a really good music scene coming up. It’s funny, because it’s not that it’s not great now, but today it just doesn’t seem the same, you know? It doesn’t seem as if there’s as much of these days in terms of newcomers, which is funny because there are so many more people — it’s more populated these days, in terms of artists and bands. The scene has changed so much, but it was so great when we were coming up, honestly. It was just a different time though, too. I wouldn’t have traded it for the world, but with CDs and tapes, I would literally take a hundred down and hand-deliver them or stuff envelopes and mail them to every record label or to radio programmers to get the music out there. I’d go make up posters for our shows and spend days putting them up all over town. It was just a different era. Today, there are so many apps and tools to help you do all those things without having to leave the house – you can make a video and then upload it to YouTube, and everyone else has that same opportunity, so it’s even more important how you separate yourself from the rest, how you grow awareness to what you’re doing. But it’s a pretty amazing deal these days that we have all of these tools to do that with. Modern technology has been a beautiful thing, but in some ways can be such a destructive thing if you’re not careful, and we’ve had to figure that out along the way. The whole “do-it-yourself,” has been pretty successful, and have been doing it our way for a long time now. We ended up selling 80,000 records out of our van, and that got us some attention, and record labels started to call. I signed a bad record deal when I was seventeen, kind of learned a lot about the business side after thankfully getting out of that (deal), then started making records for EMI — Tooth and Nail Records, actually. We spent a decade with those guys, and had an awesome time; loved those people and had a great run with them, finished out our deal with them. We had some very exciting deals on the table, and we were at the height of our career then, and we really felt that the right thing for this band was to go independent again. Thank God our audience — it’s really always been about them, such an amazing, powerful experience that they’ve rocked with us. So we removed the middle-man, so to speak, and it really was the right move for this band. It’s definitely not the right move for every band, but it’s worked out really great for us. We’re still very inspired, and it’s empowering because we make the decision on how we make the music and how we release it. We have a small team of people, we started our own label, and we cut our own deals with Walmart, Best Buy, and Target, and our small team of people is really passionate about it, and we all have the same vision. It’s been a very unique situation, but a very refreshing one. McKinny: It’s good to hear, because a lot of bands will see some initial success, but don’t know how to capitalize on that success and keep it going as independents. McNevan: We’ve been fortunate. We’ve made a lot of mistakes and learned from those, and we have also made some good choices as well, and have been fortunate to have some great people working on our team, and can draw from a wide variety of experience. It’s been a good thing, for sure. McKinny: How important has it been for you to have, not just a good marketing effort, but how important is it today for a band like yours to have good entertainment attorneys and a good grip on your intellectual property to ensure that you get your due when it comes to dealing with vendors, distributors, and the like? Is that something you’ve had to place a particular focus on as a business? McNevan: It’s definitely something you need to have in place for if and when you do need it. The really cool thing I’ve seen in our experience of going back to being independent is the sort of “underdog story” that we’ve been able to do these things for ourselves, especially with regard to the “big box” stores like Target, Walmart, and Best Buy — they’ve honestly been like champions for the band, very aggressive in promoting our brand and our music. I would’ve probably been skeptical about that before going forward, but it’s honestly been almost the exact opposite experience. I mean they’ve been really supportive — we work hard, they work hard, and it’s been a really cool situation, so we haven’t had to really worry about much of that, thankfully. But to answer your question, yes, it is important to have that support in place in case you ever need to use it. Nobody wants to find themselves in that unfortunate spot and then not know who to call for help. It’s important to have people you can trust to have your legal back in those kinds of situations. I will say that we have an awesome manager who is a partner on this stuff. His name is Tony Potato, and his company is called The Fuel Music & Management, and he’s just been awesome – we couldn’t have done this without him and his help. McKinny: Where did you record this last album, and who produced it? McNevan: I actually produced the record, along with my friend, Aaron Sprinkle. He’s kind of a long time producer, and that’s how we’ve made the last handful of records since we went independent. Actually, a long time ago we started investing in home studios and really good gear so we could have world-class signal change, and over time we’ve built some great studios that have enabled us to make some great records at really low cost and do them in our own time, in our own homes, so we make our records remotely, ourselves. Each member will record their tracks themselves, and I oversee the process. It’s been a pretty amazing situation for us – it’s not for everybody, though; not everybody would want to do it that way, but it has been a really cool thing for us, because we’ve always lived in different cities and we all dig that side of it, too. I’ve been busy songwriting for most of my career for other bands as well, so it gives me the autonomy to work on several projects at once without keeping other people waiting. It cuts down on travel time and expenses, and everyone really just digs the way we work together. It allows each of us to work at whatever capacity we want. The coolest thing is that instead of spending a couple hundred grand on a record, catering budgets, hotels, and all that kind of thing, we are able to make a really great record at an amazingly low cost and our sound quality doesn’t suffer at all. We talk about this sometimes, because there’s a piece of it that you kind of miss – something special happens when you stop life for 8 weeks and head into a studio somewhere and everyone’s in the same room focusing on the same thing — those are great times, too. But looking back, I’m glad we’ve done it the way we’ve done it for our sakes, because everyone has families now, and it’s amazing to do this and still be able to be with our respective families and children and have a part in their lives, and it’s not as hard a thing when we have to leave for two or three months to go out and tour for a new album because we’re not gone so much as we would have been if we were also taking time out of our family lives to produce, record, and mix/master an album on top of it all. McKinny: When you guys go out on tour, do you bring your families — wives, children — with you? McNevan: You know, the wives used to come out a little bit, and then they kind of found that it was just easier for us to come home on weekends or whenever we had a break for a couple of days and then head back out for the next leg of the tour. It’s really easy for things to sort of turn into “Groundhog Day” when you’re not busy out there on the road. I mean, we love what we do, and there’s a reason why we’re out there every night on stage, but it’s not the same for the wives who come along for the ride. There’s not a lot to do unless we’re someplace fun, like Vegas where there’s something going on that they would really dig, then they’d come out and have a little fun with us for the weekend or something, which is cool. But they’ve all got things they’re into doing, and then add the kids into the mix and priorities change. It’s pretty understandable, really, and things have worked out well for everyone concerned. We all try to make the most of the time we have together when we’re on tour, and the same applies when we’re at home. McKinny: When do you start this latest tour? McNevan: The latest Winter Jam 2017 Tour started on January 6th. We did our first production rehearsal for this tour in Charleston, West (By-God!) Virginia, at the Civic Center, and we hit the ground running there for the first show of the tour on the following night, a Friday! It’s gonna be a blast, really! The rehearsal is just to shake out the cobwebs and make sure that everything is keyed in and ready to go with our lighting, sound, and the band. This tour will run from January through April. It’s a 60-city tour in major cities across the country, so we’re really looking forward to starting out. McKinny: Which acts will be supporting you on this headlining tour? McNevan: There are quite a few bands on this bill, which is the way we like it; it gives us a really wide variety of different bands for us to check out and play with. There’s this hip-hop artist called Britt Nicole, and this new contemporary rock band called Tenth Avenue North. And there is this really cool rock-folk sort of band called Crowder out of Texas that really mixes things up – you’ve got to check them out… Also on the bill is Colton Dixon from (Season 11) American Idol – there are a couple of other acts that are on the bill as well — just check the tour schedule for a complete list of all the acts on the tour. McKinny: It must be a nice change of pace to be touring with so many different artists and musical genres to keep things exciting and fresh. McNevan: Yeah, it’s a blast, man! This whole tour, just the way they’ve put it together… We did Winter Jam one other time about three years ago, and it’s a really good community to be a part of. It’s almost like family, you know? There are a couple hundred people out there just touring together, making music and putting on a great show. What more could you ask for? McKinny: Regarding touring — what are the best and worst parts of touring for you now? McNevan: You know, most of it is great. I’m not just saying that. I still love most of it, just as much as I did when I was a sixteen year old kid. The part that gets old, I guess, is the travel. It’s that piece that just comes with the territory, though, where you’re away from your family and your kids. That can get a little crazy when the schedule gets kind of nuts — you lose sleep for long periods of time, and the older you get, the harder that stuff gets. But I’m not complaining. I love it, and I feel blessed to be part of the band and get to do this for a living. That’s the only thing that really gets a little old is the travel and losing sleep. McKinny: Anything special you’d like to say to your fans as you guys head out onto the road for your latest tour? McNevan: We just want to say “Thank You” honestly for your love and support, and for walking this journey with us, and for continuing to believe in the band, our music, and what we do. We couldn’t do this without them, so we’re thankful for them and humbled by their continued love and support. We truly appreciate it, and we want to wish a Happy New Year to all our fans, friends, and family out there! You can find Thousand Foot Krutch on the road from now through April at a music venue near you by going to http://2017.jamtour.com/ to find show locations and dates, as well as purchase tickets.